AlphaECC has just received the letter of intent for Petronas Crigali Vietnam to carry out the procurement, fabrication, offshore installation and commissioning for 03 more flowlines. AlphaECC has completed the onshore fabrication for bridge piping spools those will be soon installed offshore on JVPC platforms, Randong Oil Field, offshore of Vietnam. 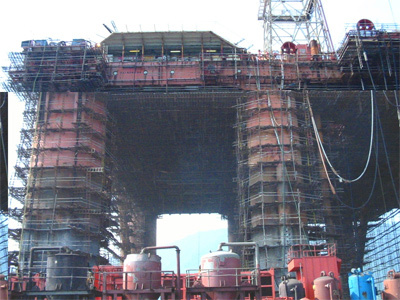 AlphaECC's currently awarded by MODEC to provide the scaffolding service for the shutdown activity of MV9 FPSO, working on Black Lion field of Cuulong JOC (operated by Conoco Phillip). Cuulong JOC has just issue an order to AlphaECC to start the fabrication of some platforms and structural steelworks for the minor modification of their Sutuden oil platform, offshore of Vietnam.